a few, are the slowing global economic growth, the inconclusive trade war between the US and China, and the strengthening Thai Baht currency as inflation remains low, which altogether may cause export growth to slow down compared to the prior year. Having considered the above-mentioned circumstances, the Bank of Thailand increased the policy rate from 1.50% to 1.75% in December 2018 to balance the economic growth momentum and the stability of the financial system. The performance of Central Pattana Public Company Limited (“The Company” or “CPN”) in 2018 shows total revenue of THB 36,458 mn, a decrease of 5.4% from the same period in the previous year (YoY), and net profit of THB 11,216 mn, a decrease of 17.3% YoY, mainly due to the recognition of non-recurring income from the insurance claim under terrorism coverage of THB 3,500 mn in the prior year. Excluding the non-recurring items CPN reported total revenue of THB 36,065 mn, a 16.8% increase YoY, and net profit of THB 10,823 mn, a 9.4% increase YoY. The result demonstrates the growth resiliency of CPN’s operating results despite the ongoing major renovation at CentralWorld and the transfer of CentralFestival Pattaya Beach to CPN Retail Growth Leasehold REIT (“CPNREIT”) in December 2017. CPN continues to emphasize on effective revenue generation through new shopping malls, enhancement of existing malls, new mixed-use development projects, such as residential development, as well as efficient cost management. CPN currently manages 32 shopping malls with the net leasable area (NLA) of approximately 1.7 mn sqm. At the end of 2018, the average occupancy rate for CPN’s retail properties stood at 93%. On September 12, 2018, CPN Pattaya Co., Ltd., (“CPN Pattaya”), a wholly owned subsidiary of CPN, acquired shares of GLAND equivalent to 50.43% of total issued and paid-up shares, for THB 10,162 mn, or at THB 3.10 per share, from a group of major shareholders in GLAND. Subsequently, CPN Pattaya made a tender offer to purchase the remaining shares, or 49.57% of total issued and paid-up shares, at the offer price of THB 3.10 per share. A total of 17.10% of total issued and paid-up shares was accepted for a total amount of THB 3,445 mn. Hence, CPN effectively has 67.53% ownership in GLAND as announced to the Stock Exchange of Thailand (SET) on November 5, 2018. 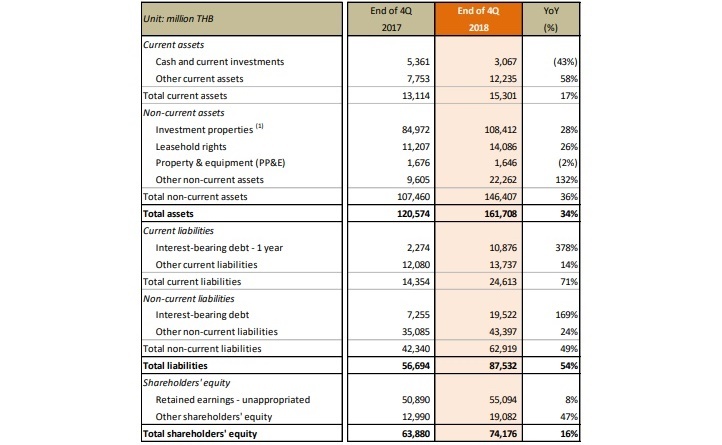 For the consolidated financial statements at the end of 2018, CPN recorded an increase in total assets at THB 36,938 mn, mostly from investment properties at THB 23,254 mn, and an increase in total liabilities at THB 17,796 mn, mainly from interest-bearing debt of THB 7,695 mn based on the events above. CPN is currently in the process of reviewing the investment plan to develop the assets of GLAND. CPN constantly looks for new investment opportunities, including mergers and acquisitions (M&A), to reinforce its business plan and long-term growth strategy. 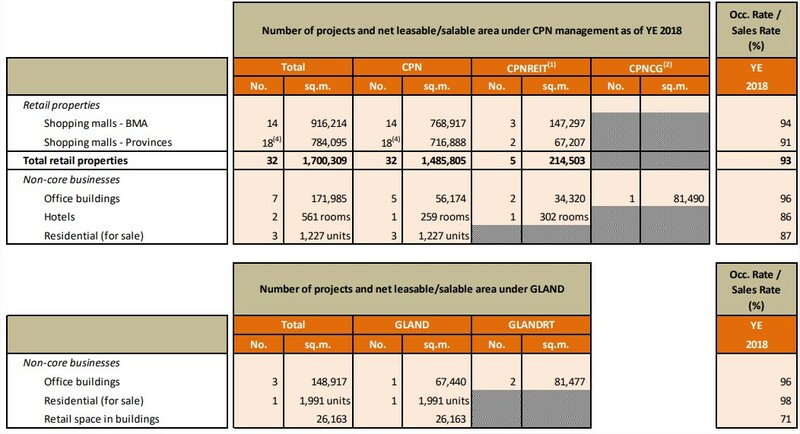 The acquisition of GLAND marks an important step for CPN towards becoming the leader in mixed-use development projects, as many of GLAND’s assets are located in high-potential locations capable of large-scale project development, thus increases the competitiveness in the industry and create sustainable return to shareholders in the long-term. The opening of Central Phuket, the largest shopping complex in the southern part of Thailand. Covering over 111 rai of land, the complex reigns as the first luxury flagship of CPN, seamlessly blending the lifestyle and relaxation experience. Positioned as the Magnitude of Luxury & Leisure Resort Shopping Destination not only for local communities but also foreign tourists. The new section, Central Phuket Floresta Building, was opened on September 10, 2018, as the luxury and lifestyle destination that features famous global brands, as well as a variety of shops and restaurants. It also features the world’s first and only global attractions, namely 1.) Tribhum, the virtual 3D interactive walkthrough experience to open in 1Q19 ; 2.) Aquaria, which features over 25,000 marine species to open in 2Q19 and 3.) Tales of Thailand, the center of cultural heritage, from past to contemporary, from all parts of Thailand. Asset Enhancement Initiatives to increase the value of existing shopping malls, customers, tenants and societies, and create long-term returns. In 2018, CPN progressed with the following asset enhancement initiatives. Major renovations comprises 1.) CentralWorld, which has been ongoing in phases since 4Q16, has been significantly re-developed as of 4Q18. At the end of 2018, the occupancy rate of CentralWorld stood at 91%, an increase from the end of 2017 at 84% and 2.) CentralPlaza Rama 3, which completed a major renovation with a grand re-opening in August 2018, showed occupancy rate at 92% by the end of 2018, an increase from that of the same period last year at 82%. Renovation programs commenced in 2018 and to be completed in 2019 comprises major renovations at 1.) CentralPlaza Chiangrai and 2.) CentralPlaza Chonburi, with both locations to undergo leasable area expansion of around 2,000 sq.m. per location for new tenants and expansion of existing shops, as well as incorporating various destination concepts, such as Food Destination and Co-working space, to name a few. Similarly, minor renovations are underway at 1.) Central Phuket Festival, which will see the area previously occupied by Central Department Store, now re-opened in the Floresta section, re-developed into leasable area ; 2.) CentralPlaza Lardprao, which will see the introduction of new destination concepts as well as integrate the mall entrance area with the future sky train station and 3.) Central Festival Pattaya Beach, which will see the food zone re-development to include new vendors catered towards both locals and foreign tourists. CPN sees the potential in mixed-use development projects, which consist of residential projects, office buildings and hotels, in the same complex as the shopping malls to support and maximize the benefits of the latter’s business. In 2018, CPN have made notable progresses in the following mixed-use development projects. Residential projects that are completed and in the process of transfer to customers at 3 locations, namely ESCENT Rayong, ESCENT Chiangmai and ESCENT Khonkaen, which are condominium projects launched in 2016 and have been sold out. As of 2018, 97% of all units have been transferred to customers with the remaining unit transfers to continue. Residential projects that are open for pre-sale and in the process of construction at 5 locations, 3 of which are in the provincial area, namely ESCENT Nakhon Ratchasima, ESCENTVILLE Chiangrai and ESCENTVILLE Chiangmai, which are condominium projects launched in 2017 and have been sold out. The other 2 projects are located in Bangkok, namely Phyll Pahol 34, a condominium project located next to the Senanikom BTS station and also in close proximity to CentralPlaza Lardprao, and Niyham Boromratchachonnani, a single-detached housing project located on Boromratchachonnani Road and in between CentralPlaza Pinklao and CentralPlaza Salaya. Sustainable Growth as a Core Principle in Business CPN is selected to be the member of the Dow Jones Sustainability Indices (DJSI) in 2018. The inauguration into the DJSI World index, in which CPN is the only real estate company and one of eight Thai companies to achieve the feat, and the DJSI Emerging Markets for the fifth consecutive year (2014-2018). This is a testimony to CPN’s philosophy on sustainable business operations by taking into consideration the interests of the whole, the environment, the related parties and continuously partake in driving the well-being of society and communities forward. The opening of “IKEA Bangyai” at CentralPlaza WestGatein March 2018 signifies the largest IKEA store in Southeast Asia, with an area of more than 50,000 sq.m. with multiple entries and exits at all floors seamlessly integrated with CentralPlaza WestGate. The partnership with IKEA, the world’s leading furniture brand, reinforces CentralPlaza WestGate’s vision as the super-regional mall in western Bangkok and support the urbanization in the Bangyai area. Hence, CentralPlaza WestGate has seen more than 12% increase YoY in foot traffic and more than 30% increase YoY in car traffic after the opening of IKEA Bangyai. The extension of land leases of CentralPlaza Rama 2was made on June 28, 2018. The extension is made for an additional 30 years, expiring in 2055 and 2060 (some parts), hence presented the opportunity to further develop the shopping mall. CPN is currently preparing the proposal of terms and conditions for the land and property sublet rights to CPNREIT to consider the extension of the leasehold of CentralPlaza Rama 2. The joint-venture agreement to run a co-working space business in Thailand with a total of 3 joint venture parties, namely 1.) CPN ; 2.) Common Ground Work Sdn. Bhd. from Malaysia and 3.) MSB Asia Ltd. from Malaysia, with investment proportions at 51%, 29% and 20% respectively in a new joint venture company. 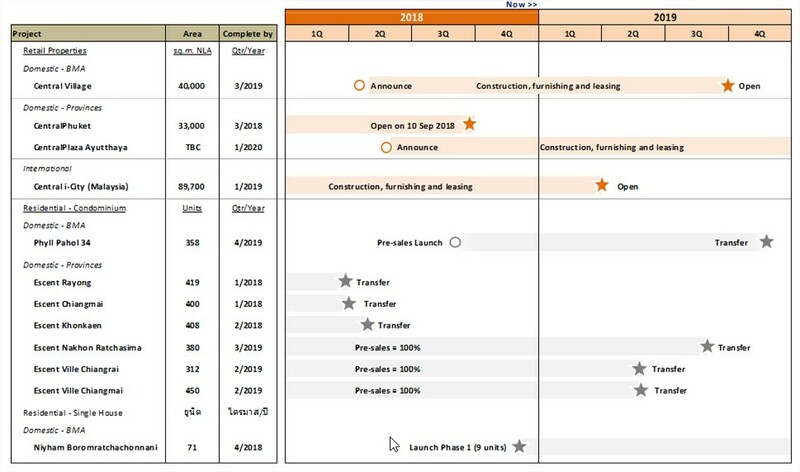 Major renovation at CentralWorld, which has been ongoing in phases since 4Q16, is progressing as planned and on-track for full re-launch in 4Q18. In 3Q18, the occupancy rate of CentralWorld stood at 86%, a slight increase from 3Q17 at 83%. Major renovations at 2 shopping malls namely 1.) CentralPlaza Chiangrai and 2.) CentralPlaza Chonburi. Consistently posting strong performances, the two malls will undergo leasable area expansion for new tenants and expansion of existing shops, as well as incorporating various destination concepts, such as Food Destination and Co-working space, to name a few. Preparations for the renovations are underway and will be progressively completed in 2019. Minor renovation at 3 shopping malls namely 1.) CentralFestival Pattaya Beach 2.) CentralPlaza Lardprao and 3.) Central Phuket Festival. They will undergo zoning revisions, refreshing tenant mix and new interior and exterior decorations in some areas, as well as introducing successful destination concepts, such as Food Destination and Fashion Destination, to enhance the convenience of and services towards the customers. Diversification into Mixed-use Development Projects CPN sees the potential in mixed-use development projects, which consist of residential projects, office buildings and hotels, in the same complex as the shopping malls to support and maximize the benefits of the latter’s business. In 3Q18, CPN have made notable progresses in the following mixed-use development projects. Residential projects that are completed and in the process of transfer to customers at 3 locations, namely ESCENT Rayong, ESCENT Chiangmai and ESCENT Khonkaen, which are condominium projects launched in 2016 and have been sold out. The transfer of these projects is expected to complete within 2018. Residential projects that are open for pre-sale and in the process of construction at 4 locations, namely ESCENT Nakhon Ratchasima, ESCENTVILLE Chiangrai and ESCENTVILLE Chiangmai, which are condominium projects launched in 2017 and have been sold out. The other project, Phyll Pahol 34, a condominium project in Bangkok located next to the Senanikom BTS station and also in close proximity to CentralPlaza Lardprao, was launched for pre-sale in September 2018. As of December 31, 2018, CPN managed 32 shopping centers (14 projects in Bangkok Metropolitan Area (BMA) and 18 projects in the provinces), 30 food courts, 7 office towers, 2 hotel properties, 1 residential property (totaling 11 units), and 3 real estate properties for sale (totaling 1,227 units), which includes the properties transferred to CPN Retail Growth Leasehold REIT (“CPNREIT”) and CPN Commercial Growth Leasehold Property Fund (“CPNCG”). At the end of 2018, the average occupancy rate of CPN’s shopping malls stood at 93%, a slight increase over that of the previous year at 92%. This was largely attributed to the increase in occupancies at the recently renovated shopping malls, namely CentralWorld and CentralPlaza Rama 3. In 3Q18, the average rental rate of all shopping malls stood at THB 1,682 per sqm/month. Same store rental rate growth is at 3.9% from THB 1,600 per sqm/month in the previous year to THB 1,662 per sqm/month as a result of rate escalations, contract renewals and lower discounts given to tenants at most shopping malls. In 2018, same store rental revenue growth stood at 3.1% YoY. The same store rental revenue excludes that of 1.) the new malls in 2017, namely CentralPlaza Nakhon Ratchasima and CentralPlaza Mahachai; 2.) the new mall in 2018, namely Central Phuket Floresta 3.) malls under renovation during 2017 and 2018, namely CentralWorld, CentralPlaza Rama 3, CentralPlaza Chonburi and CentralPlaza Chiangrai, and 4.) CentralFestival Pattaya Beach, part of which was transferred to CPNREIT in 2017. In 2018, the average rental rate of all shopping malls stood at THB 1,669 per sqm/month. Same store rental rate growth is at 2.5% from THB 1,634 per sqm/month in the previous year to THB 1,674 per sqm/month, which was slightly below the level in the prior year due to lower-than-expected rental rate increases at some shopping malls, as well as additional discounts given towards the end of the year. Despite the minor setback, the rental rate growth in CPN’s total portfolio continues at a healthy trajectory as rate escalations from contract renewals and lower discounts given to tenants at most shopping malls were solid. The following non-recurring items are excluded from the analysis of the financial results in 2018 compared to the same period in the previous year. In 3Q18, CPN made an accounting adjustment related to the original land lease contract at CentralPlaza Rama 2 for THB 308 mn. The amount, recorded as other income for the period, came about following the extension of the land lease agreement on June 28, 2018, which will be in effect until years 2055 and 2060 (some parts). Hence, the adjustments are made under Other Income at THB 308 mn in 3Q18 and at THB 85 mn in 4Q18. In 3Q17, CPN received an insurance claim of THB 3,500 mn under the terrorism coverage, which was recorded as other income for the period. 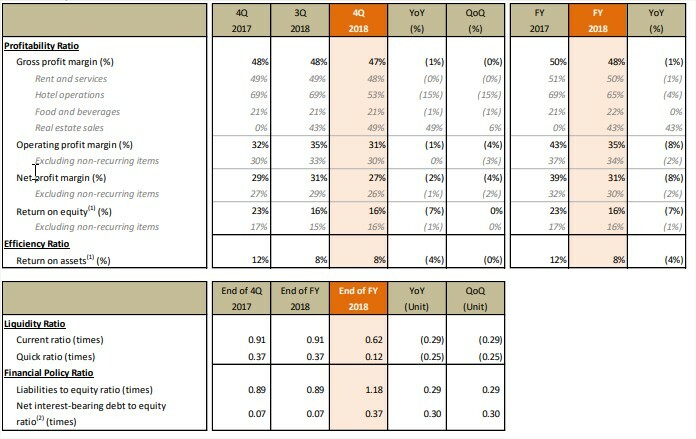 In 4Q17, CPN recorded a net income of THB 175 mn, which primarily represented the asset acquisition fee, as a result of the transfer of CentralFestival Pattaya Beach (certain parts) and Hilton Pattaya Hotel following the conversion of CPNRF to CPNREIT. In 2018, CPN reported total revenue of THB 36,065 mn, an increase of 16.8% YoY (for 4Q18, total revenue stood at THB 9,247 mn, an increase of 18.0% YoY). Excluding other income, total revenue derived from operations increased approximately 18.0% YoY, which went according to plan. 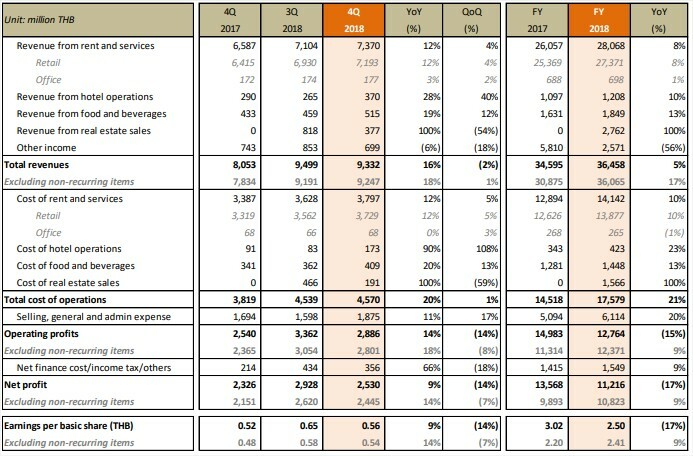 Main components of revenue are as follows. In 2018, the in-mall food court business recorded revenue of THB 1,849 mn, an increase of 13.4% YoY (for 4Q18, the figure stood at THB 515 mn, an increase of 19.0% YoY) due to the following factors. Performance improvement from malls under major renovation in 2017 and gradually open in 2018, namely CentralWorld and CentralPlaza Rama 3. Strong performances of existing shopping malls, such as CentralPlaza Rama 2, CentralFestival Chiangmai, CentralPlaza WestGate, CentralPlaza Nakhon Si Thammarat and CentralPlaza Pinklao. • Strong performances of existing food courts both in BMA and provinces, such as CentralPlaza Rama 2, CentralFestival Chiangmai, Central Marina and CentralFestival Samui. Hotel operations are considered CPN’s non-core businesses. In 2018, revenue from hotel operations was THB 1,208 mn, an increase of 10.1% YoY (for 4Q18, the figure stood at THB 370 mn, an increase of 27.6% YoY). The increase is largely attributed to the change in service charge recognition for the entire year of 2018, previously recorded as net revenue, to report gross revenue and costs. Meanwhile, revenue from hotel operations increased slightly despite a drop in average occupancy rate at Hilton Pattaya stood, from 94% in the previous year to 93%, and at Centara Hotel and Convention Center Udonthani, from 80% in the previous year to 75%. Although occupancy rates at both hotels were impacted by the lower number of tourist bookings, average room rates at both hotels increased YoY. Revenue from sales of real estate comprises the transfer of ownership in residential units to customers, which CPN began to record the sales from 2018 onwards. In 2018, revenue from sales stood at THB 2,762 mn (for 4Q18, the figure stood at THB 377 mn), which primarily represents 97% of total units transferred to customers at 3 condominium projects, namely ESCENT Rayong, ESCENT Chiangmai and ESCENT Khonkaen. In 2018, CPN reported other revenue of THB 2,178 mn (for 4Q18, the figure stood at THB 614 mn). The majority of the amount relates to the management fee received from CPNREIT and CPNCG, which stood at THB 767 mn, an increase of 56.0% YoY (for 4Q18, the figure stood at THB 223 mn, an increase of 90.5% YoY) and in line with the increase in total asset value of CPNREIT following the asset transfer in late 2017. In 2018, CPN reported total costs of THB 17,579 mn, an increase of 21.1% YoY (for 4Q18, the figure stood at THB 4,570 mn, an increase of 19.7% YoY). Main components of the costs are as follows. Costs of rent and services constituted utilities, security & cleaning services, on-site personnel, land rental, depreciation & amortization, repair & maintenance costs and insurance premium and property tax of properties owned for rental. In 2018, CPN reported cost of rent and services at THB 14,142 mn, an increase of 9.7% YoY (for 4Q18, the figure stood at THB 3,797 mn, an increase of 12.1% YoY). The rise in cost is higher than the increase in revenue and comes from the following factors. Higher operating and depreciation costs of newly opened malls and renovated projects in 2017, namely CentralPlaza Nakhon Ratchasima, CentralPlaza Mahachai and CentralPlaza Rama 3, and of the newly opened mall in 2018, namely Central Phuket Floresta. Utility costs, a major component (accounts for approximately 30% of cost of rent and services) for shopping mall operations, increased from the same period a year earlier amidst the continuous rise in electricity Ft rate since the middle of 2017. CPN, meanwhile, achieved efficiency gains with the reduction in electricity unit consumption compared to last year. As a result, same-store utility cost increased only 0.9% YoY, thanks to CPN’s continuous effort to conserve energy usage. Hence, the cost-to-revenue ratio is expected to be similar to the magnitude of last year amidst the increasing trend of electricity Ft rate. Higher maintenance, repair and personnel expenses to support the expansion of new shopping malls. Costs of food and beverage constituted costs of operating in-mall food centers, as well as depreciation and repair & maintenance costs of food center equipment and furniture, and decoration costs. In 2018, CPN reported costs of food and beverages at THB 1,448 mn, an increase of 13.0% YoY (for 4Q18, the figure stood at THB 409 mn, an increase of 19.9% YoY). The rise in cost is in-line with the growth in food and beverages revenue from the higher cost base from the new food courts opened at new malls in 2017 and 2018, namely CentralPlaza Nakhon Ratchasima, CentralPlaza Mahachai and Central Phuket Floresta. Due to better cost management of the existing food courts in the Food Destination zones, CPN can attain an optimum level of operating cost for its food and beverages business.. In 2018, CPN reported costs of hotel operations at THB 423 mn, an increase of 23.1% YoY (for 4Q18, the figure stood at THB 173 mn, an increase of 90.9% YoY). The increase is largely attributed to the change in service charge recognition for the entire year of 2018, previously recorded as net revenue, to report gross revenue and costs. That aside, the cost of hotel operation is generally in-line with the increase in revenue with both hotels showed effective cost control in both room and food and beverage management. In 2018, CPN reported cost of sales at THB 1,565 mn (for 4Q18 the figure stood at THB 191 mn), in-line with the growth in sales of real estate due to the transfers at ESCENT Rayong, ESCENT Chiangmai and ESCENT Khonkaen condominium projects. Total administrative expenses constituted expenses on personnel, marketing & promotion, office supplies, professional fees, and depreciation and amortization of office equipment and hotel properties. In 2018, CPN reported total administrative expenses at THB 6,114 mn, an increase of 20.7% YoY (for 4Q18, the figure stood at THB 1,875 mn, an increase of 13.3% YoY). The increase is mainly attributed to higher personnel expenses to support business expansion and higher marketing expenses from more frequent events and activities at malls. Additional administrative expenses in 2018 include costs associated with transfers of condominium units, rental expense of Hilton Pattaya Hotel based on the sublet agreement with CPNREIT, and expenditures associated with shares acquisition in GLAND. Hence, the administrative expenses to total revenue ratio stood at 17.0%, which is higher than the previous year’s at 16.4% (for 4Q18, the ratio stood at 20.3% compared to the previous year at 21.1%). In 2018, CPN’s gross profit ratio, excluding other income, dropped to 48.1% from 49.6% in the previous year (for 4Q18, the figure stood at 47.1% compared to the previous year at 47.7%), whilst operating profit ratio dropped proportionately to 34.5% from 36.6% in the previous year (for 4Q18, the figure at 30.8% compared to the previous year at 30.2%). Excluding the sales of real estate, gross profit ratio in 2018 would be 49.8% as CPN achieved a gross profit ratio for the sale of residential projects at 43.3%. The gross profit and operating profit margins remain at levels similar to the previous year despite incurring higher cost of rental and services at CentralPlaza Rama 2 following the land lease extension. Hence, CPN is determined to exercise effective cost management and prudent cost control measures to maintain its profitability. In 2018, CPN reported a net profit of THB 10,823 mn, an increase of 9.4% YoY (for 4Q18, the figure stood at THB 2,445 mn, an increase of 13.7% YoY) due the growth in revenues of all businesses, effective cost management and accordingly with the business environment, increases in management fees and share of profit from investment in CPNREIT. Meanwhile, CPN incurred higher financing cost from additional interest-bearing debt following the acquisition of GLAND. As of December 31, 2018, CPN reported total interest-bearing debt of THB 30,398 mn, an increase from the balance as of December 31, 2017 of THB 9,529 mn, mainly due to the increase in short-term borrowings to fund the shares acquisition of GLAND and the consolidation of GLAND’s interest-bearing debt, which has a higher average cost of debt than CPN’s interest-bearing debt. As a result, the weighted average financing cost at the end of 2018 rose to 3.31% compared to the level at the end of the previous year at 3.17%. Fixed interest rates debt comprises 46% of total interest-bearing debt whilst floating interest rates make up the remaining 54%. Net interest-bearing debt to equity ratio stood at 0.37 times, an increase from 0.07 times from the end of last year, on higher net debt as mentioned above and on lower cash and short-term investments. CPN emphasizes on the importance of effective management of its capital structure to be resilient towards the volatile money market and capital market, as well as maintain its financing cost at an optimum level for its businesses going forward. 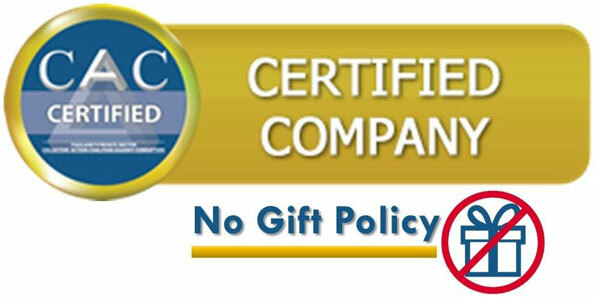 CPN has a dividend policy of no less than 40% of annual net profit. On February 21, 2019, the Board of Directors passed a resolution to propose to the Annual General Meeting of Shareholders, to be held on April 26, 2019, to approve the dividend payment of THB 1.10 per share paid from the 2018 net profit. Hence, the proposed dividend payout ratio from the 2018 consolidated net profit is at 44.0%. (1)(1) Investment Properties are booked at cost and depreciated with the straight-line basis over the life of the assets. The estimated fair value is THB 219,161 mn (THB 180,409 mn as of December 31, 2017), stated in the disclosure notes to the main financial statements no. 14 under “Investment Properties”. CPN has set a 5-year (2019-2023) growth strategy that aims to achieve a compounded annual growth rate (CAGR) in revenue of at least 13% per year. The strategic direction to expand the business through mixed-use development, such as new shopping malls, enhancement of existing shopping malls, rental rate escalations, incremental gains from operations management, and residential project development, are key drivers to realize the target. Furthermore, CPN studied the opportunities to expand its business into the Southeast Asian countries, especially those with high growth potential, such as Malaysia, Vietnam and Indonesia, to accommodate its sustainable growth aspiration. CPN have announced the plan to launch 2 new malls to open in 2019 and early 2020, namely 1.) Central Village, the first international luxury outlet in Thailand, in 3Q19 and 2.) CentralPlaza Ayutthaya by early 2020. CPN also made continuous progress with the asset enhancement initiatives, particularly with CentralWorld, which is on track for completion in 1Q19. Furthermore, major renovations at CentralPlaza Chiangrai and CentralPlaza Chonburi, as well as minor renovations at CentralFestival Pattaya Beach, Central Phuket Festival and CentralPlaza Lardprao, have already commenced and will gradually be completed in 2019. Furthermore, CPN sees the opportunity to develop mixed-use projects as an integral part of long-term growth. In 2017, CPN announced the plan to undergo a joint venture investment project with Dusit Thani PCL (“DTC”) to develop a mixed-use project comprising a hotel, a residential project, a retail space and an office building at the corner of Silom Road and Rama 4 Road. CPN currently engages in joint development of Central i-City in Malaysia on the grounds of the country’s growth potential and diversification of investment risk. Central i-City, with its strategic location and promising potential in area, is a joint venture investment between CPN, with 60% ownership, and I-R&D Sdn. Bhd (“IRD”), a subsidiary of I-Berhad, the other 40% ownership. The project is currently undergoing exterior and interior furnishing processes and on course for opening in March 2019. Moreover, CPN is currently preparing an investment plan in Vietnam, a market with exceptional growth potential in the region that will be an important driving force in the company’s long-term growth. CPN recognizes the potential to develop mixed-use projects in the shopping mall area by utilizing the existing vacant plots of land adjacent to the shopping malls, thus enhancing the value of investments in the form of residential development, office buildings and hotels, to name a few. Residential development To-date, CPN has launched a total of 7 condominium projects in Bangkok and in the provinces, as well as 1 single-detached housing in Bangkok. Moreover, CPN continues to study new areas for possible development as a pipeline for future project announcements.